Chia seeds (Salvia hispanica L.) are a well-known food, partially thanks to the constant marketing of their “superfood” properties. Historically, chia originated in Mexico and has been part of the human diet for about 5,500 years. Although the composition of the seed is variable and depends on the region where it grows, the USDA food database reports that, on average, chia seeds are 16% protein, 30% fat, and 42% carbohydrate by weight. They also boast a high content of fiber (34%) and the omega-3 fatty acid, alpha-linolenic acid (18%). The nutritional composition of chia seeds, especially the high protein, fiber, and alpha-linolenic acid content, has led to several investigations regarding chia’s health effects and potential as a so-called functional food. Studies on rats have demonstrated that adding chia seeds to the diet leads to favorable changes in blood lipids and can reduce visceral fat and insulin resistance. Several acute studies in healthy adults have reported that eating both milled and whole-seed chia reduces post-meal blood glucose levels and increases satiety when the chia is consumed alongside a standard oral glucose tolerance test or when the chia is baked into white bread. Despite a promising preclinical basis for using chia seeds in the management of metabolic disease risk factors, data on the long-term impact of chia supplementation is scarce and inconsistent (as shown in Figure 1). In healthy adults with overweight or obesity, supplementing chia seeds appears to have little impact on bodyweight or composition, blood lipids, inflammation, or blood pressure. There was also no effect of chia seed supplementation on bodyweight, measures of glycemic control, or blood lipids in patients with type 2 diabetes, although it did lead to a significant reduction in blood pressure and C-reactive protein. None of the aforementioned interventions lasted longer than 12 weeks, leaving the possibility that the benefits of chia seed supplementation on metabolic disease risk factors may take more time to manifest. The study under review sought to determine the effect of chia seed supplementation over six months in participants with type 2 diabetes, making it the longest intervention to date. Chia seeds have been investigated as a potential functional food in the management of metabolic diseases due to their high protein, fiber, and omega-3 fatty acid content. Interventions in healthy adults with obesity have not supported a positive effect of chia supplementation on disease risk factors, but an intervention in participants with type 2 diabetes suggests there may be a benefit. The study under review sought to examine the effect of chia seed supplementation in participants with type 2 diabetes over six months. The study under review involved older (average age: 60 years) overweight and obese adults who had type 2 diabetes for at least one year and an HbA1c between 6.5 and 8.0% (average: 7.0%). Roughly three-fourths were on glucose-lowering medications, the primary being metformin therapy, while 25% were on lipid-lowering medications and 60% were on blood pressure lowering medications. Only one-fifth of the participants managed their diabetes without medications. None of the participants used insulin. Over a six-month intervention period, the participants were randomly assigned to supplement their diet with either 30 grams per 1000 kcal of ground chia seeds (average 40 grams per day) or with 36 grams per 1000 kcal of an oat bran mixture (average 49 grams per day), which acted as a positive control group (i.e., researchers expected to see an effect in this group). The oat bran mixture contained 26 grams of oat bran, seven grams of inulin fiber, and three grams of maltodextrin to match the total dietary fiber (approximately 10.5 grams) and energy content (approximately 115 kcal) of the chia seed supplement. The macronutrient breakdown of these foods is shown in Figure 2. The supplements were provided to the participants in two forms: one-third was baked into a whole-wheat bread and the remainder was given as a powder to be consumed as preferred. All participants met with a dietitian at baseline, two weeks, and every sixth week thereafter for six months to receive individualized nutrition counseling based on the Canadian Diabetes Association dietary and lifestyle guidelines for people with type 2 diabetes, which included advice to follow an energy-restricted diet (approximately 500 kcal per day). Three-day food logs and symptom questionnaires were collected at each visit to assess dietary adherence and adverse events, respectively. The primary outcome was the change in bodyweight after six months. Secondary outcomes included waist circumference, HbA1c and fasting glucose, body composition, satiety-related hormones (ghrelin and adiponectin), plasma fatty acid composition, and C-reactive protein (inflammation). A sample size of 31 participants per group (62 total) was determined a priori to be necessary to detect a weight difference between groups of about three kilograms. A total of 77 participants were randomized to the intervention, but only 54 completed the six-month protocol. Dropouts were similar between groups and occurred primarily for reasons unrelated to the intervention. 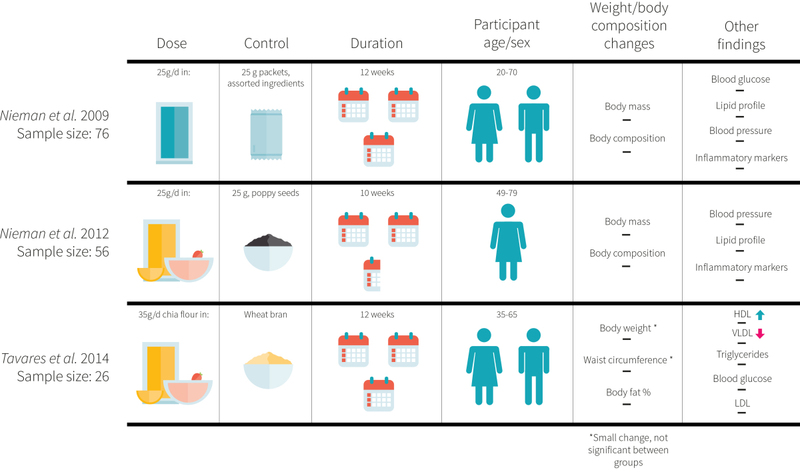 A modified per protocol analysis was used to assess the data, whereby any participants lasting at least 18 weeks were included in the analyses (58 people). Older adults with type 2 diabetes were randomized to consume chia seeds or an oat bran control for six months in combination with standard diabetes management advice based on the Canadian Diabetes Association. The primary outcome was a change in bodyweight. Adherence to the interventions was similar between groups, averaging 85-94% in the chia group and 82-84% in the oat bran group. No major adverse events were reported, with comparable symptom reporting between groups (mainly a transient increase in mild gastrointestinal complaints). Neither group significantly changed their intake of calories or macronutrients compared to baseline except for a similar significant increase in dietary fiber (26-27 grams at baseline vs. 35-37 grams at six months) and omega-6 fatty acid intake (seven to nine grams at baseline vs. 12-13 grams at six months). Additionally, the chia seed group significantly increased their intake of omega-3 fatty acids, which was significantly greater than the oat bran group after six months (nine grams vs. one gram). Supporting the reported dietary difference in omega-3 fatty acid intake, the chia seed group had significantly greater blood levels of alpha-linolenic acid than the oat bran group. No other dietary nutrient was significantly different between groups. Bodyweight was significantly reduced in the chia seed group compared to the oat bran group (-1.9 vs -0.3 kilograms). Additionally, the chia seed group had a significantly greater reduction in waist circumference and C-reactive protein, and a significantly greater increase in adiponectin. However, there were no differences in body fat percentage, HbA1c, fasting glucose, or ghrelin. Supplementing the diet of people with type 2 diabetes with approximately 40 grams of ground chia seeds per day led to significantly greater weight loss than supplementing with a calorie- and fiber-matched oat bran mixture over a six-month period. It also reduced inflammation and waist circumference more than oat bran. However, it did not differentially influence body composition or measures of glycemic control. The study under review suggests that incorporating chia seeds into the diet of older adults with well-controlled type 2 diabetes may facilitate weight loss compared to a mixture of oat bran and inulin. The degree of weight loss amounted to about 2.2% of initial bodyweight, which is close to the 3-5% weight loss likely to result in clinically meaningful reductions in metabolic risk factors. An explanation for the superiority of chia seeds compared to the oat bran and inulin mixture is not clear. Although there was no self-reported difference in energy intake or macronutrients between groups, the greater weight loss in the chia seed group suggests that these records are not accurate. Chia seed fiber is insoluble, with a high water-binding capacity that makes it form a thick gel when mixed with liquids. Oat beta-glucan and inulin are both soluble fibers with a low viscosity. It has been previously demonstrated that chia seeds result in reduced appetite compared to flax seeds, another non-viscous fiber. Thus, there is a possibility that the chia group was more satiated and ate less food, regardless of what was being reported by the participants. Without measures of satiety and appetite, however, this remains speculation. The weight loss observed in the study at hand becomes more difficult to interpret considering other published research. The authors of the current study had previously conducted a pilot trial in a similar population of older, overweight adults with well-controlled type 2 diabetes. The methodology and the way chia seeds were incorporated into the diets of the participants were also similar, except that only half the dose of chia was provided (15 grams per 1000 kcal) and it was compared to a wheat bran control. In this earlier study, there was no significant difference between groups in weight loss over 12 weeks. Three other studies by independent labs have also found no effect of chia seeds on weight loss. Importantly, these studies involved overweight and obese adults without type 2 diabetes and lasted no longer than 12 weeks. One study provided 50 grams of whole chia seeds per day and compared it to a calorie- and macronutrient-matched control powder made from concentrated soy, sunflower oil, carrot fiber, and tapioca starch. Both supplements were to be consumed on an empty stomach before breakfast and dinner (25 grams at each) after sitting in water for ten minutes. In a follow-up to this study, researchers compared 25 grams of whole and ground chia seeds to a poppy seed control. Each serving was to be consumed as preferred by the participants so long as it was not heated in any way. The third study had participants consume 35 grams of chia flour per day or a wheat flour control, both of which were to be consumed as the participants preferred. None of these studies reported a significant difference in body weight between the chia seed group and the control. Several important differences between all previous research and the study under review could explain why they failed to document a beneficial effect of chia seed consumption on bodyweight. The study at hand provided individualized nutrition counseling that included advice on how to incorporate the intervention products into the diet while maintaining an energy deficit. By contrast, the other studies just had people add the products into their diet. It could also be that weight loss differences required a larger sample size or longer study duration to be observed, both of which occurred in the study at hand. Finally, weight loss wasn’t statistically apparent in the study at hand until week 18; all other studies stopped after 12 weeks max. Aside from changes in bodyweight, several other metabolic disease risk factors have been assessed in the available evidence discussed thus far. The pilot trial in adults with type 2 diabetes documented improvements in blood pressure and inflammation but not glycemic control. These findings were partially supported by the study at hand, which also observed reductions in inflammation but no changes in HbA1c or fasting glucose. The lack of change in glycemic control may be the result of concurrent medication use that masked any benefit, since both studies had at least half the participants using metformin alone or in combination with other glucose-lowering medications. The three independent studies found no benefit of chia supplementation on blood lipids, blood pressure, or inflammation when compared to the control. The discrepancy with the study at hand may be owed to the use of healthy adults rather than adults with type 2 diabetes. This study was well-designed, with a randomized, double-blind structure and alternative fibrous control group helping to reduce potential bias. The length of the intervention also adds novelty to the findings, as all other trials up to now have been no longer than 12 weeks. However, the dropout rate was rather large and resulted in a study less powered than the researchers would have liked, meaning that all results should be taken with a grain of salt. Similarly, no adjustments for multiple comparisons were conducted, increasing the likelihood that some findings could potentially be the result of chance rather than the intervention. It should also be noted that the lead author is a consultant for and has received money from a chia seed company and holds a patent on a viscous fiber blend for treating diabetes and metabolic syndrome. This in no way discredits the data, but it’s important to be aware of this information when drawing conclusions and comparing this study to other research. Chia seed supplementation may result in greater weight loss than supplementing oat bran and inulin in adults with type 2 diabetes when combined with individualized nutrition counseling. An explanation for this superiority is not clear but may have to do with the type of fiber within chia seeds and their ability to promote satiety. Although chia seeds are purported to be a superfood based on their nutrient profile, the only available evidence supporting their inclusion into the diet relates to their fiber content and ability to form mucilage when mixed with liquids. Regardless, it is not uncommon for chia seed consumption to be promoted for their high omega-3 fatty acid content, protein content, and vitamin and mineral content. Chia seeds contain exclusively alpha-linolenic acid, the short-chain omega-3 fatty acid found primarily in plants that does not contribute the same health benefits observed with the consumption of the long-chain omega-3 fatty acids, EPA and DHA. This isn’t to say that there is no benefit from consuming alpha-linoleic acid, but it’s important to not generalize findings about EPA and DHA to all omega-3 fatty acids. For example, the ability for EPA and DHA to reduce triglycerides and inflammatory markers are well-established and have been discussed in detail in ERD 21, Volume 1 and ERD 23, Volume 2. By contrast, meta-analyses have suggested that alpha-linoleic acid supplementation does not affect C-reactive protein or most other cardiovascular disease risk markers. 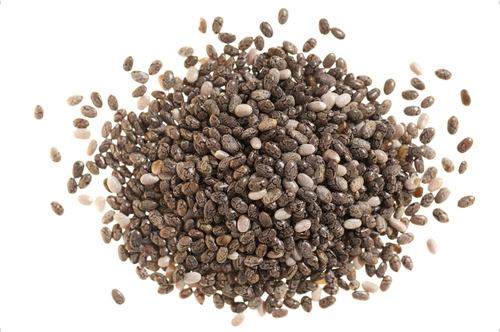 Chia seeds are 16% protein by weight and are suggested to contain a good balance of essential amino acids. 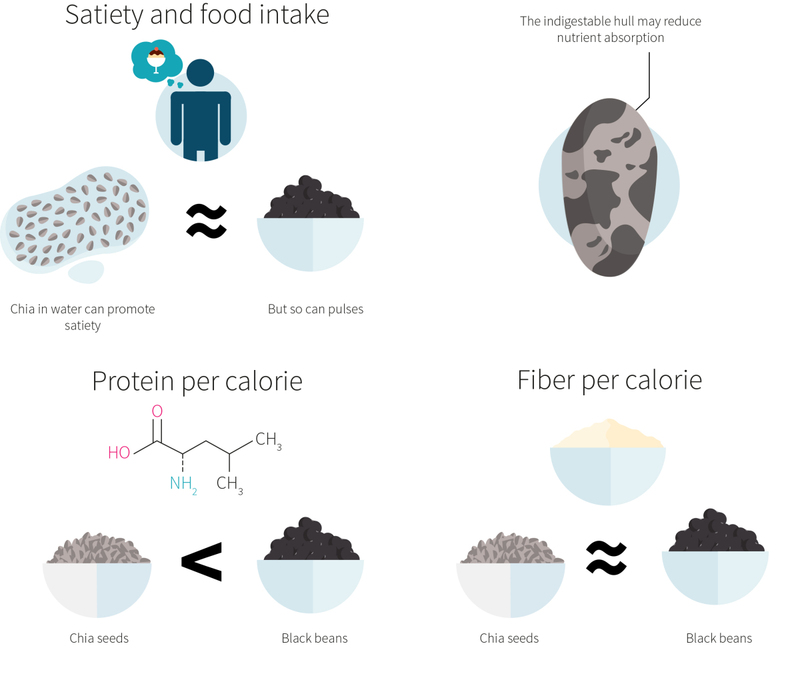 However, to obtain 20 grams of protein from chia seeds would bring with it 580 kcal, which is twice that of legumes (e.g., 290 kcal of black beans) and up to five times that of lean beef (e.g., 105 kcal of top round). To rely on chia seeds as a source of protein would be difficult, especially in the context of a weight loss diet that mandates energy restriction. Can chia seeds contribute protein to a balanced diet? Yes, but there does not appear to be anything special about them in this regard. The vitamin and mineral content of chia seeds may be misleading, because of the seed’s indigestible hull that likely prevents the absorption of many of these micronutrients. Ground chia seeds may overcome this limitation, but no studies have investigated the bioavailability of chia seed nutrients. It is important to understand that chia seeds can benefit health and be a worthy food to eat regularly through the fiber they contribute to the diet. We just don’t know how unique their benefits are, as indicated in Figure 3. 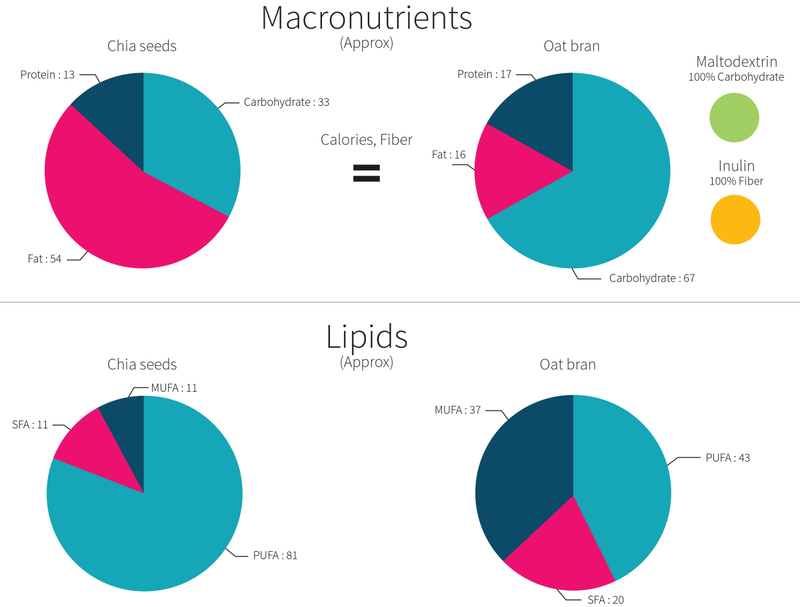 Chia’s high water-binding capacity makes the seeds highly viscous in water, which is suggested to have the greatest effect on appetite and food intake, even if their impact on bodyweight is relatively small. This matters because most studies find no benefit of acute fiber consumption on either variable, probably because there is a diversity of fibers that have different characteristics. Accordingly, chia seeds may benefit some people who respond well to the satiating effects of fiber. Chia seeds are promoted as a superfood for a variety of reasons, but the evidence is only fairly strong for their fiber content. Would eating flax seeds be a suitable replacement for chia seeds for helping with weight loss? Flax seeds (Linum usitatissimum) and chia seeds are quite similar regarding their high fiber and alpha-linolenic acid content. Like with chia seeds, there is limited evidence investigating the effect on weight loss of incorporating flax seeds into the diet. A recent study in adolescents found that consuming an ounce (28 grams) of flaxseed on weekdays had no effect on blood lipids, inflammation, or body composition compared to a wheat bran control. However, the average intake of flax was only half that intended (14 grams per day) and it was baked into cookies, cakes, and pastries to promote consumption, which provided an extra 300-400 kcal per day that may have masked any benefit of the flax seeds. The only other study to look at the impact of flaxseed on weight loss was retracted (there was still no difference between 60 grams flax seed or a rice flour control). Chia seeds are a purported “superfood” that have garnered interest for the management of metabolic diseases due to their high protein, fiber, and omega-3 fatty acid content. To date, however, the only available evidence supporting their inclusion into the diet relates to their fiber content. Interventions in otherwise healthy adults with obesity have not supported a positive effect of chia supplementation on disease risk factors over 12 weeks, but the study under review suggests that there may be a benefit for weight loss in people with well-controlled type 2 diabetes over six months. The reason for this discrepancy is not clear but may relate to the longer trial duration and the fact that the study under review provided individualized nutrition counseling, while the previous trials did not.